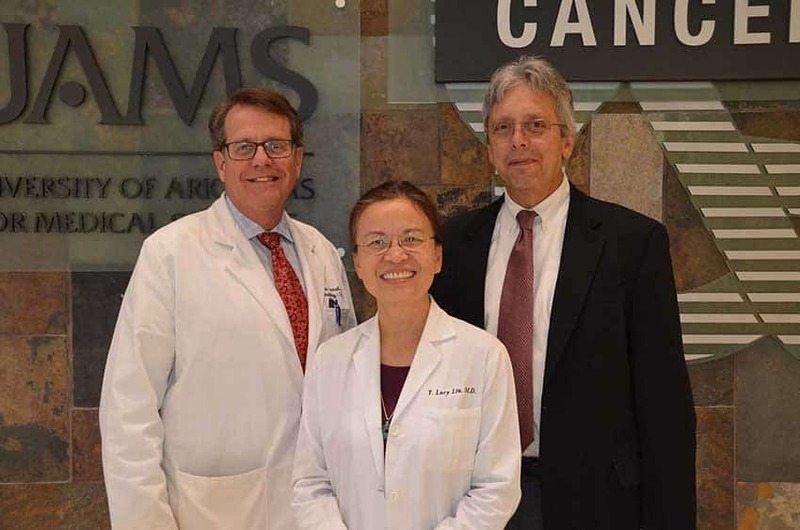 UAMS authors on the study were (L-R) Peter Emanuel, M.D. ; Lucy Liu, M.D., Ph.D., and Kimo Stine, M.D. Oct. 20, 2015 | LITTLE ROCK – New findings on juvenile myelomonocytic leukemia (JMML) by researchers at the University of Arkansas for Medical Sciences (UAMS) and collaborators at other institutions were published online this month by the medical journal Nature Genetics. UAMS scientists collaborating on the research titled “The Genomic Landscape of Juvenile Myelomoncytic Leukemia” were led by Peter Emanuel, M.D., director of the UAMS Winthrop P. Rockefeller Cancer Institute and a professor in the Division of Hematology/Oncology, and included Y. Lucy Liu, M.D., Ph.D., assistant professor in the Division of Hematology/Oncology, and Kimo C. Stine, M.D., professor in the Department of Pediatrics, all in the UAMS College of Medicine. JMML is a very rare and aggressive form of childhood leukemia most often found in children younger than 6. Only about 50 children in the United States are diagnosed with JMML each year. While the most successful therapy is bone marrow transplantation, this intensive treatment is only effective for about 50 percent of patients and can result in long-term side effects. The UAMS study, published Oct. 12, confirms two important findings that can assist doctors in determining which patients will most likely respond to existing treatment options and which are candidates for experimental or other therapies. The findings include confirmation that JMML arises due to abnormalities in the Ras signaling pathway within blood cells. Ras proteins control signaling pathways that affect cell growth and division and can lead to the mutations found in tumors. The study also revealed that the number of genetic mutations present at diagnosis is an important predictor for prognosis and survival. “These findings are a major step forward in understanding the development of this rare disease and future advances in treatment, not only for JMML but also for other more common leukemias,” said Emanuel, who has studied JMML since 1986 and was one of the first — along with Kevin Shannon, M.D., professor of pediatrics at the University of California San Francisco — to hypothesize the study’s findings concerning the Ras signaling pathway. Emanuel and Shannon’s research groups have collaborated on JMML research for 23 years. Additional investigators from the Broad Institute of Harvard and MIT and St. Jude Children’s Research Hospital participated in the study, which used cell and tissue samples collected during a five-year nationwide clinical trial conducted by the National Cancer Institute’s Children’s Oncology Group. “Our study examined the entire genome of many JMML patients, thanks in large part to those who donated cells and tissue during the clinical trial,” Emanuel said. The cell and tissue bank, which is housed at UAMS, provided more than half of the specimens used in the study. A second JMML study also published on Oct. 12 by Nature Genetics corroborated the UAMS group’s findings and referenced Emanuel’s research as supporting documentation.